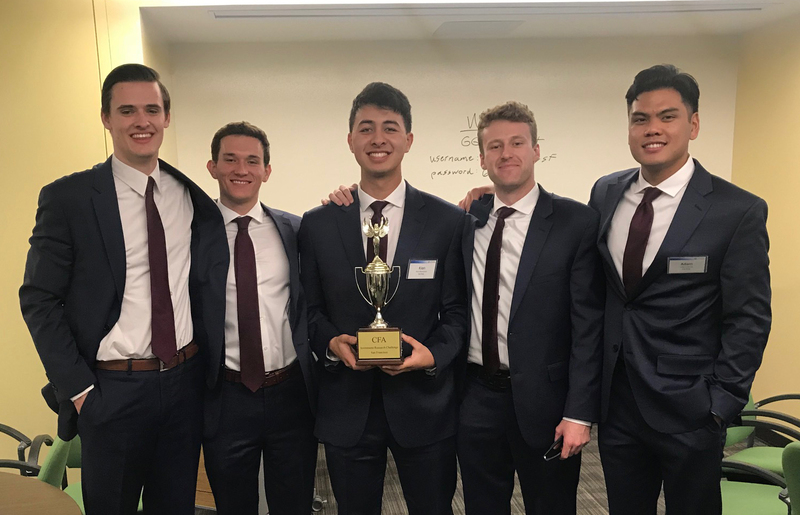 SAN LUIS OBISPO — A team of Orfalea College of Business students won the Northern California Chartered Financial Analyst (CFA) Investment Research Challenge sponsored by the CFA Society of San Francisco. The students competed against teams from 12 Bay Area universities, including graduate and undergraduate programs from Santa Clara, St. Mary’s, San Jose State, Hult International Business School, and UC Santa Cruz. The competitors were charged with analyzing and making buy/sell/hold recommendations for Salesforce.com, a cloud computing company headquartered in San Francisco. A panel of industry professionals and CFA charter holders judged the presentations. Cal Poly was represented by finance students Benjamin Consoli of Redwood City, Adam Pasco of Burbank, and Kian Ramezani and Coby Snyder of San Luis Obispo, along with economics major Mason McCloskey of San Luis Obispo. Finance Professor Cyrus Ramezani and finance alumnus Scott B. Kirk served as team advisors. Cal Poly alumni David Dudek, Aaron Hay, Dario Buechi, Joey Guerra, Stephen Marotto, Alyssa Gustafson and Paul Boortz supported the team by critiquing its presentation prior to the final competition, and the group also made time to cheer on Cal Poly. Cal Poly business and economics students took first place in the local Chartered Financial Analyst Institute Research Challenge in San Francisco. From left, Mason McCloskey, Benjamin Consoli, Kian Ramezani, Coby Snyder and Adam Pasco.